Bamako — At least three hostages were killed on Friday in the Radisson hotel in Bamako where the Malian Special Forces stormed and "could free ten people," said the spokesman of the Malian Department of Homeland Security. "Three hostages were killed," said the spokesman, adding that the nationalities were being verified. "Special forces were able to release a dozen people, "he said, adding that the number of the attackers of the property is "two or three". They attacked the hotel around 7:00 (GMT) and held people, the official of the Ministry of Security said, noting that much customers and employees were locked in rooms and were therefore not under direct threat of the kidnappers. 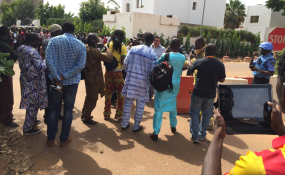 Earlier, the Rezidor Hotel Group which manages the Radisson Blu, located near the center of the Malian capital said that two people hold 140 customers and 30 employees." The hotel received airline crews notably.